Pippa King “Smart Cities” Smart for who? ‘Smart’ Cities – smart for who? It’s estimated that by 2050 two thirds of the world’s populations will be living in cities, with current migration from countryside to cities at around one million people per week. How will the world’s cities cope with the sheer numbers they will have to deal with? – by being ‘Smart’. ‘Smart’ cities are cities that are run by machine lead intelligence, artificial intelligence (AI). Monitoring and controlling energy, water, traffic, air quality, responsive city administration systems and ‘safer and secure’ public spaces. This is ultimately done by monitoring us – human movement and behaviour security cameras and sensors. With the imminent introduction of the Internet of Things (IOT) this sensor lead lifestyle is being set up for our future living. 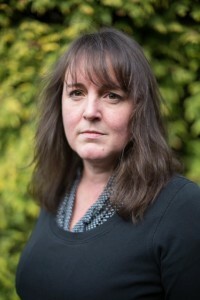 Pippa King is a campaigner for children’s rights after her children were nearly fingerprinted in school, without her consent, in 2005, for a library system. With other parents she lobbied parliament for transparency regarding biometric technology in education. This resulted in part of the Protection of Freedom Act 2012 covering parental and children’s consent and their rights to refuse to use biometric technology in schools. She is a regular blogger on biometrics and RFID in education, and on wider state surveillance. Through her research she has advised various government committees, initiated written questions in parliament, with interviews and quotes featured by the BBC, The Times and The Guardian. Artist: Pippa King “Smart Cities” Smart for who?